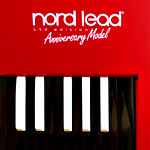 Nord User Forum - View topic - How Many Mellotron and Chamberlin Sounds can I Load? How Many Mellotron and Chamberlin Sounds can I Load? I've been intoxicated trying out all the Mellotron/Chamberlin sounds on the Stage 3 at my local music store. I'm now considering buying one. I'm curious how many of these specific samples I can load at one time? I saw the numbers of the complete M/C set referenced in another thread - approx 700 to 850mb. The Stage 3 specs say it has 480 mb memory for samples, yet the Electro 6D has 512mb. Is this correct ? I can load more samples into the Electro 6? Re: How Many Mellotron and Chamberlin Sounds can I Load? Last edited by maxpiano on 15 Apr 2019, 15:14, edited 2 times in total. Oh - OK, thank you very much. I will look at the site to try and determine the size myself...I thought it might be hard to do. I see there's quite a few more than that link shown above...all of the Chamberlin Harp arpeggios, the rhytym kits and fills...the Mellotron Master tapes. I'll have to figure out how to calculate all their sizes? You have the complete sample sets on the Clavia website. Admittedly it's a bit tricky to find with all the "archive", 2.0 and 3.0 sample sets, they really should put some order in the sample library. Anyway it's there, just download all the sets, check how many total samples and Mb are there, and then start uploading them to your instrument and play away! Sorry, I didn't realize you meant all the M/C library not just the V3 I linked, anyway taking data from Nord website and make a few sums should be pretty quick to do. Last edited by maxpiano on 16 Apr 2019, 18:39, edited 1 time in total. Very interesting observation - some seperate memory for the synth samples maybe? I would like to have those as well! iluvchiclets wrote: Very interesting observation - some seperate memory for the synth samples maybe? I would like to have those as well! Last edited by maxpiano on 16 Apr 2019, 18:43, edited 1 time in total.